I don't know about you, but I love January, I love the feeling of a new year, a fresh start. I like to see each new year as 365 blank pages of a twelve chapter book, we get to write ourselves a new story. My 2016 story was quite boring, it wasn't a book I would re-read, maybe certain chapters, maybe even just some pages, but overall, I don't feel like it excited me enough to keep it on my bookcase, easy to grab and reread. I am dedicated to making a change in 2017. This year I will be graduating from uni, I will enter the real world, the world of working 5 days a week, a world of being an adult with a career, taxes and a savings account. I know, I know I am going to be an actual adult this year and it is freaking me out, so let's forget that part of 2017 for the rest of this post. I have decided in 2017 I want to have a refresh, I bought myself a new TV and a new laptop, I have decided to start reading again and so far this year I have read 3 and a half books in the past 3 weeks. I have decided to clear my mindset and try to only focus on things that bring me joy a la Sarah Knight (read The Life-Changing Magic of not Giving a F**k, it's changed me). To top it all off I want to refresh something very important to me, my wardrobe. Although my blog focuses a lot on beauty, makeup, skincare, cosmetics and all that jazz (have I mentioned that La La Land also changed me? Go see it now) I have a huge, massive, humongous, ginormous love for fashion, for clothes and styling and shoes, god I love shoes. So next payday I plan on making a pretty large ASOS order, and probably a Missguided order, maybe a River Island one too, might dabble on Topshop, check out H&M... to sum it up, I am going to try my best to squeeze thousands more clothes in my overflowing wardrobe and drawers. 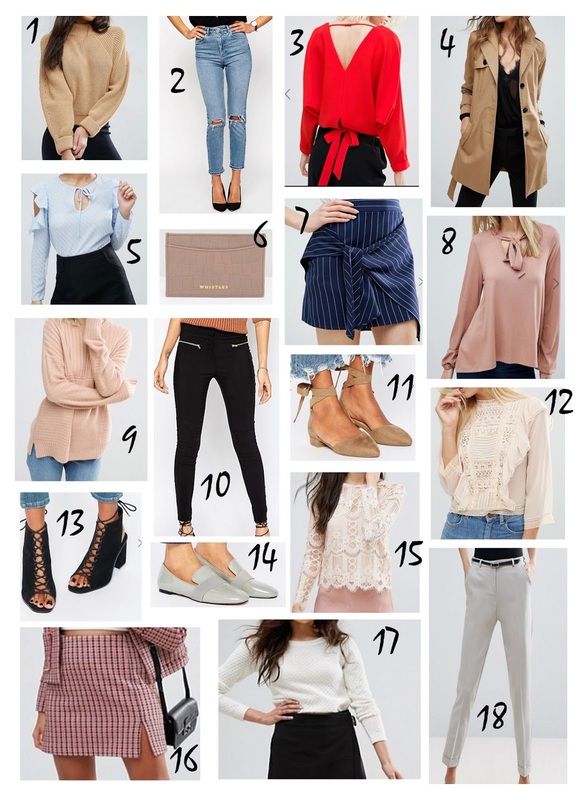 Since we are all about sharing here on heythererobyn, I thought I would share with you some pieces I have my eyes on over on one of my favourite clothing websites, ASOS. I seem to be loving lace right now and ribbons, blouses, jumpers... I am not entirely sure what my style falls under, I have been described as preppy by some, business casual by other, I like to refer to my style as me. I don't like the idea of putting myself in a box of deciding I am girly or edgy, I like to wake up in the morning and pick an outfit that I like and feel comfortable in. Something I am in love with right now is lace up shoes, I love the ones in number 11 that are almost like ballet shoes with a ribbon tied around your ankle, number 13 are gorgeous too, and being black would definitely fit in with my usually black attire. Although as you can see, I am trying to branch out and wear more colours, and incorporate brighter tones into my wardrobe. Doesn't the skirt in number 16 remind you of Clueless too? It looks terrifyingly short, but I really want to look like Cher, minus the mustard yellow, because us sallow skin girls are yellow enough without wearing mustard. I am in desperate need of a card wallet, I tend to leave the house with just my bank card in my pocket, but then I miss out on all my points cards, because who wants to carry 18 cards in their pocket? Number 6 is from Whistle and looks perfect, I love the neutral shade, which of course seems to be my palette for my wardrobe refresh except number 3, but red is my all time favourite colour so I couldn't give that a miss. Is there anything here you would buy too? Or anything that is just not you, tell me in the comments!